A couple balances their sunny Miami Beach life with a swanky, stylish colonial in Cape Porpoise. One day, a developer friend called Steve Oraham and Jim Samson at their Miami Beach home to say he’d found a “great house in Cape Porpoise and you’re really dumb if you don’t buy it”—a bit of exhortation that was a joke (in its putdown) but earnest enough. “He was probably sick of us staying in his house,” Samson opines. More joking. But the truth was he and Oraham had been coming to the Kennebunks for 20 years, so owning there made a certain sense. The project required a crane to lift off the entire back roof of the house so Lord could replace beams that had rotted, pour a foundation where there had once been rubble stone, install radiant heating under a pre-engineered white oak floor, and add a wood- burning fireplace. The latter was a priority for Oraham and Samson, as they wanted to visit in the fall for Thanksgiving and in the winter for snowy weekends, but also because they viewed the fireplace as a starting point for the home’s aesthetic. “I didn’t want a typical, happy-Fourth-of-July summer house,” Samson says. 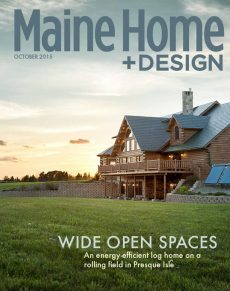 “I wanted a moody, edgy feeling.” And, indeed, the home ￼seems less like a sunny Maine vacation cottage than a low-lit, swanky establishment combining period details and antique furniture with stylish, midcentury modern touches. They took it all the way inside as well. “You have to mix high and low. That is the whole trick,” says Samson, and by that he means, in part, that you have to mix original finds with things that you might discover at a favorite store. For instance, the dining room area of the great room has a rosewood Saarinen table with a black base and Eames chairs from Design Within Reach. Elsewhere, upholstered sofas and chairs are from Restoration Hardware. Meanwhile, a 1900s sideboard is from Antiques on Nine in Kennebunk, and the midcentury chairs of rosewood and black leather are from Carboni Antiques in Wells. A lamp made of a candlestick holder was fashioned by Smith- Zukas in Wells. “It’s like 1stdibs.com right here in Kennebunkport,” Samson says of the array of local antiques options he’s found. That said, some pieces come from his more far-flung travels. Oraham and Samson bought a chest of drawers at a flea market in Parma, Italy. They once owned an antique shop in Miami, and after living with the chest for years, they sold it at the shop. Later the woman to whom they’d sold the piece was moving into a new apartment, which she wanted Oraham and Samson to decorate. Seeing the old chest, Oraham and Samson expressed interest, and the woman gifted the chest back. Carter talks about his own work in spiritual terms: the fencing “is adorned with the sacred feminine,” he says, which is his description of the plant material, and he speaks of healing the land after the violation of breaking up existing ledge and restructuring the ground. He applies this sort of language and thinking to the entire Oraham and Samson project, which he sees in light of their life in general. Miami is all about sun and light and going outside. “It’s yang,” Carter says. In Maine, the couple can be more internal. “When they come here, it’s cooler. It’s shadier. It’s more yin.” This makes the Cape Porpoise house not just a home but the very thing one might wish for in a life: balance. Balance that comes in a most appealing container.